Many banking products consumers thought the President won't assent to the Banking (Amendment) Bill 2015.However to kenyans surprise, President Uhuru signed it into law on 24th August 2016. The new banking law in summary ,required the lenders to keep interest rates on credit facilities at around 10.5%pa,make all charged fees open to customers and increase the interest rates on savings. 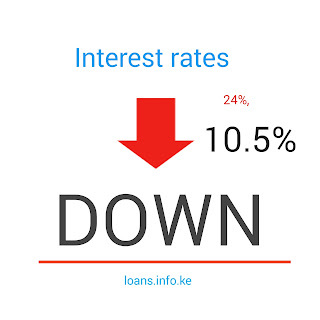 The CBR was placed at 14.5%pa and many lenders followed.Major banks including; KCB,Cfc Stanbic bank,Barclay's bank,Cooperative Bank,Chase Bank IR and GTBank Kenya have adopted a 14.5%pa interest rate on new and existing loans. Now, every Kenyan is asking their banks especially on social media, how and when this new rate will be effected. Banks like the KCB bank and Cooperative bank have already directed their customers to their respective branch credit managers to get everything revised. It looks like the lenders have been exploiting the Kenyan consumer with high loan interest rates at around 24%pa. Kenyans are rejoicing the existence of the new banking law now.